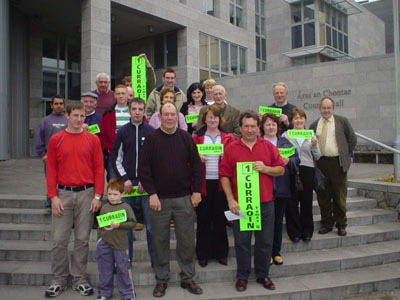 The nomination of Conamara election candidate Tomás Ó Curraoin. Sinn Féin is the oldest political movement in Ireland. It takes its name from the Irish Gaelic expression for ``We Ourselves''. Since being founded in 1905, Irish Republicans have worked for the right of Irish people as a whole to attain national self-determination. The movement founded almost 100 years ago by Arthur Griffith evolved into a number of organisations which carried the name. Republican Sinn Féin broke from (Provisional) Sinn Féin in 1986. Republican Sinn Féin believes that the historic Irish nation is a distinct, coherent unit and is entitled to exercise its own independence. It believes, using the words of one of the 18-Century founders of Irish Republicanism, Wolfe Tone, in the urgent need to “break the connection with England, the never-failing source of all our political evils”. It stands for the complete overthrow of British rule in Ireland. Republican Sinn Féin is abstentionist. It does not recognise the legitimacy of the Six or 26-County States in Ireland, both of which were created by acts of the British parliament in Westminster as a denial of the wishes of the Irish people. Therefore, it does not give voluntary recognition to either jurisdiction. Republican Sinn Féin believes in the establishment of a reign of social justice based on Irish Republican Socialist principles in accordance with the Democratic Programme and the 1916 Proclamation. It stands for the complete separation of Church and State. It believes in the central importance of the Irish language to the Irish identity. Republican Sinn Féin believes the growing European Union is becoming a world superpower in its own right and will become involved in the “resource wars” of the 21st Century. It does not believe that Ireland, with its history of being a colonial possession, should involve itself in the oppression of other nations that the growing EU will eventually mean. Republican Sinn Féin is internationalist. It has a sense that we all have a common identity as human beings, as members of the great family of peoples. It wishes to play a role in this wider world community on the basis of equality and respect for the rights of others. In particular, it seeks to eliminate the kinds of international trade and international debt that impoverish the peoples of the Third World. It advocates neutrality in respect to military alliances and power blocs and feels a sense of solidarity with all peoples who are struggling for freedom and justice. Supporters can keep current on various republican campaigns and events by joining the internet mailing list above. Irish Republican News is an Irish news organisation with a republican perspective and is Ireland's most popular source of political news. It carries a variety of stories and opinion on national affair and miscellaneous topics. Republican News is free on the Web, and a new issue is published on the internet several times a week. This website only collects personal, identifiable information, when site visitors voluntarily and explicity provide it. Data on website activity is collected only for the purpose of stastical analysis of site performance. All material is provided 'as is' without warranty of any kind, either expressed or implied, and should not be considered officially endorsed or sanctioned by Republican Sinn Fein or the website administrators. Links to organizations are provided solely as a service. Neither the links, nor the absence of links, constitute an endorsement by Republican Sinn Fein or the website administrators of the organizations, products or information and none should be inferred.